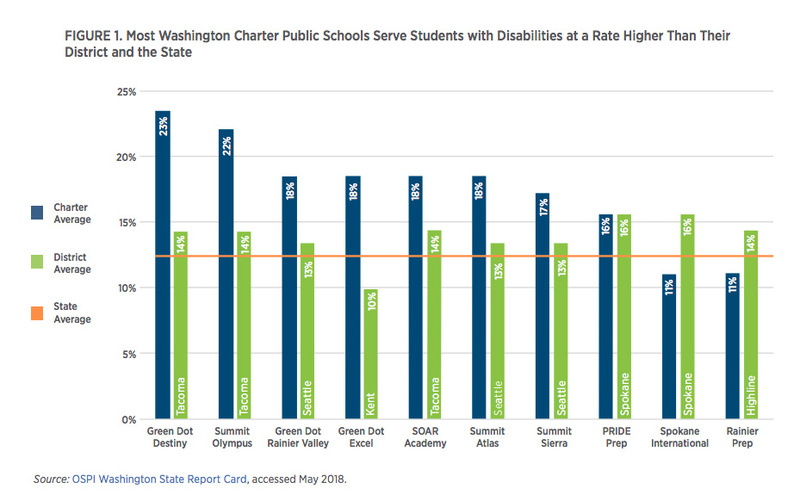 Washington State’s nascent charter school sector enrolls a higher percentage of children with disabilities than the state’s traditional public schools, new research finds. Charter students with special needs are also more likely to spend their days in inclusive environments than their peers in district public schools. The research brief was released by the Center on Reinventing Public Education, a Washington State–based research and policy center. The authors examined enrollment trends at the state’s 10 charter schools, all of which have opened since 2015. Notably, Washington reimburses schools for the cost of special education only up to 13.5 percent of total student enrollment. A public school can identify and educate special needs students past 13.5 percent of its enrollment, but it must use local or federal revenues to pay for their services. The reimbursement cap arose from the state Supreme Court’s 2012 decision in the long-running McCleary case, which ruled that the state had violated its own constitution by shortchanging public schools. 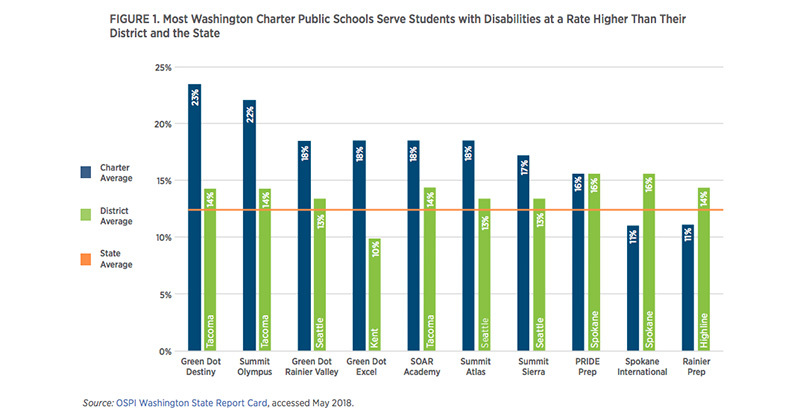 The CRPE brief finds that Washington’s tiny charter sector, which accounts for fewer than 2,400 students, enrolled 16.1 percent special needs students as of May 2018, compared with the 10.6 percent average for charters across the country. Washington’s statewide average for all public schools is 12.4 percent, beneath the statutory 13.5 percent cap. Among Washington’s individual charters, eight out of 10 enroll a higher percentage of special needs students than the state average, including two that enroll over 20 percent students with disabilities. Eight out of 10 charters also exceed their local district average. Charters do seem to educate children with a narrower range of disabilities than students in traditional schools. The vast majority of special needs students in charter schools are afflicted with health impairments or specific learning disabilities, while fewer suffer from multiple disabilities, developmental delays, or intellectual disabilities. The comparatively smaller percentages of students with developmental or communication problems is a possible consequence of age, the authors note; most children facing these challenges are identified in the elementary grades, but only three of 10 Washington charter schools serve elementary students. Special needs students enrolled in Washington charter schools are also much more likely to spend large chunks of their day in inclusive settings among students without disabilities. 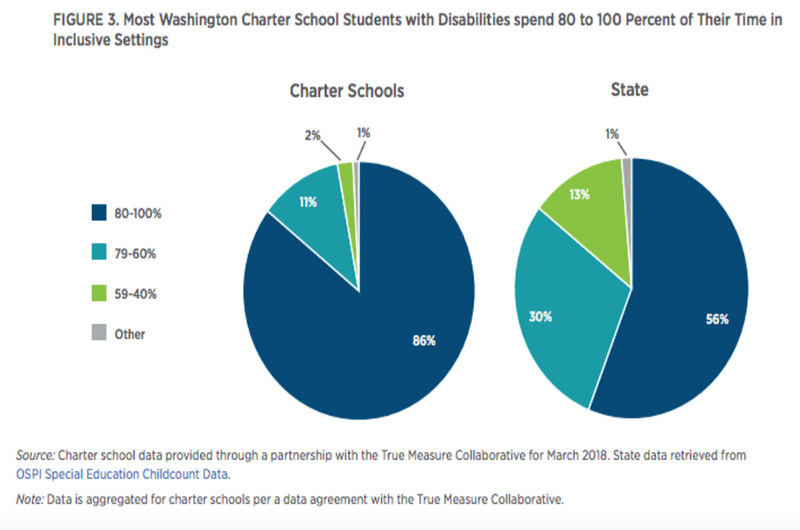 The authors find that 86 percent of Washington charter students with disabilities spend between 80 and 100 percent of their day in such settings, compared with a statewide average of just 56 percent. Historically, charters have lagged behind traditional public schools in serving special needs populations, though there is reason to think the gap between the two sectors is shrinking. In a series of case studies conducted by the National Center for Special Education in Charter Schools, researchers have found charter schools in New York and California that successfully include students with special needs in mainstream classrooms. The sector’s particular success in attracting and integrating students with disabilities could offer some welcome publicity — especially given the blizzard of legal snags that have arisen since Washingtonians voted to allow charter schools in 2012. Just as the first charters were set to open in September 2015, their funding mechanism was ruled unconstitutional by the Washington State Supreme Court. The legislature acted to change their financing, which has allowed the sector to take root over the past few years. But additional lawsuits have developed during that time — including one that came before the court this spring — that may still imperil their growth.